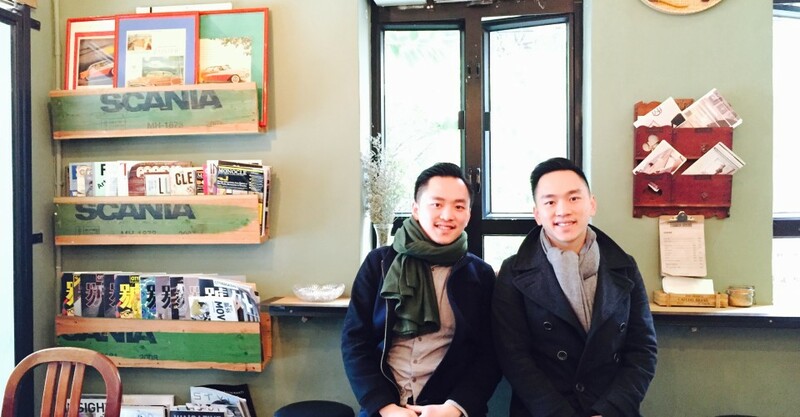 Twins Josh and Caleb Ng are co-founders of F&B consultancy Twins Kitchen as well as owners of Common Ground cafe in Sheung Wan. They tell Adele Wong how they work so well together, and where all the coolest chefs go to source local ingredients. Josh and Caleb Ng were born and raised in Hong Kong, and went to the West Coast to study economics at UCLA. After graduating, they both went on to work at Merrill Lynch before deciding to relocate back to Hong Kong and setting up a wine-importing business. Before long, they ventured into food with their own cafe and food consulting business. Today, besides creating cool concepts for other brands, the twins also take part in non-profit projects like partnering up with the government to transform unwanted food products from markets into free meals for the community. What made you move back to Hong Kong, and why did you switch to wine importing, when you both had jobs at Merrill Lynch back in California? Josh: Merrill Lynch was fun but after a year I didn’t think it was my kind of thing: too much math. [When we were in still in California], usually we would go up to Napa Valley and then back on Highway 1, and there are several oyster farms there so we would just buy several bottles of white wines and bring back hundreds of oysters. Caleb: Yes, hundreds. Usually we would eat 20-25 each, so at least like 200 for us and our friends. And it was very fun, nothing fancy. So eventually we jumped into wine importing, and we started importing good California wine [to Hong Kong]. J: Our evil plan was that we wanted to spend half our time in Hong Kong, so we could see our parents, and stay half the year in California, but it didn’t work out. C: We ended up coming back to Hong Kong because the clientele [for wine] was here. J: We sort of caught the big boom of the wine market in Hong Kong. People started drinking red and white wines even at dai pai dongs. And how did you eventually transition to food? C: Our passion is not only in wine; we love wine but we’ve always liked pairing food with the wine. J: Wine is not a common language for everyone, but food and wine is a common language. J: Do you go to those wine tastings, where it’s like ‘Oh this tastes like this, this tastes blah blah blah’ — it’s too much for me. We think food is more enjoyable. Where do you source your ingredients for your restaurants? J: Jowett Yu from Ho Lee Fook gets food from Centre Street Wet Market as well. We always bump into him. Actually Matt Abergel [of Yardbird and Ronin] sometimes goes there too. It’s a hidden gem. How do you two work so well together? J: We always try to push each other’s limits and boundaries. I can be super-mean to Caleb and he can be super-mean to me. C: But it’s the honesty that makes us grow. C: And ‘You deserve punishment,’ haha. J: We save a lot of time from the straightforwardness. J: This is one of our secrets, why we are so efficient. How do you decide what goes on the menu at your restaurants? C: For a dish, you need it to taste good. Even if you’ve got a really good concept, I think the palate is kind of honest. If the taste is right, it’s right. J: One time I tried to invent new flavors for our pancakes — I tried to put foie gras mousse in the middle with some Japanese eel, and stack them up like an opera cake. I tried several times and it didn’t work. And when 10 people tell you, ‘You still need some improvement,’ then you know it’s wrong. Read more from our Dishin’ the Dirt series.